Tucker International has developed a new tool and process to address the current crisis in global leadership. 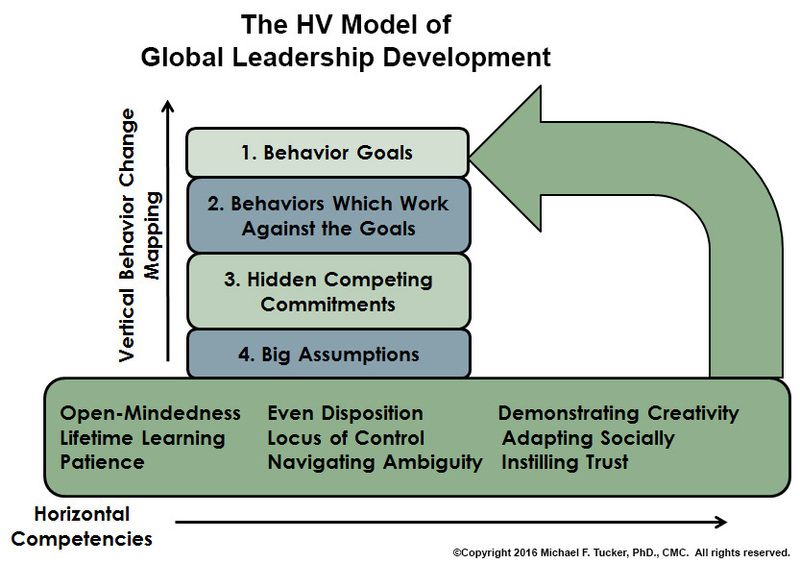 A strong case has been made that both a traditional competency approach (Horizontal) and a cognitive developmental approach (Vertical), are needed to provide the type of leadership equal to the challenges presented by the contemporary, increasingly complex global business environment. For the first time, this combined approach is now available with our HV Model. The nine intercultural competencies in the Horizontal part of the model are derived from our study of over 1800 global leaders of 41 nationalities. They are assessed by means of our Global Leader Tucker Assessment Profile (GLTAP), an 86 item, on-line instrument. We begin the development process with feedback on individual scores compared with our global data-base. The next step is a way to overcome an “immunity to change” and perform the competencies. Working with a Tucker coach, a leader can not only set out goals for developing the competencies, but can explore the underlying roots that have prevented development and made him or her “immune to change”. CONTACT US TO SCHEDULE A BRIEF WEBCAST AND DISCUSSION.